One of two flotation tanks, dubbed “escape pods,” located at Halcyon Floats in Fishtown. The 4-foot-tall tank contains 10 inches of dense salt water that allows patrons to effortlessly float in darkness, deprived of all sensations. 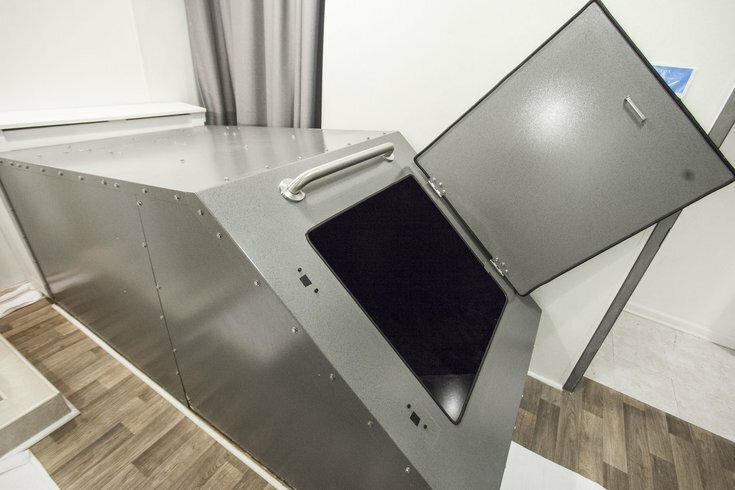 I’ve just crawled into a 4-foot-deep metal “escape pod,” where I’ll spend the next 90 minutes floating atop 10 inches of buoyant salt water, deprived of basic senses, counter-intuitively, in the name of health. My eyes search for color in the darkness but come up short, my ears welcome only the serenade of my heartbeat, and my body breathes in air that’s neither cold nor warm. It’s nerve-wracking, anxiety-producing, exhilarating. This is the float tank. 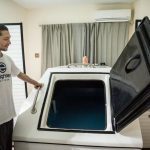 “Floating” is a spa-like service that’s meant to induce meditation, manage pain and, in some people, trigger hallucinations. 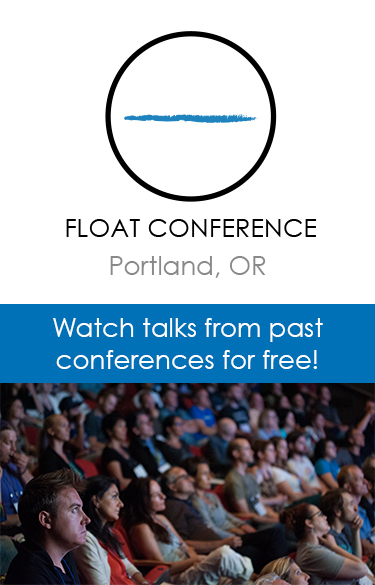 Originally billed by The New York Times as “relaxation tanks” following the success of the cult-classic 1980 film “Altered States,” floating has roots in creative expression and psychedelic curiosity. It was famously founded in the 1950s by neuroscientist, University of Pennsylvania graduate and NIMH researcher John C. Lilly, who coined it as Restricted Environmental Stimulation Therapy and coupled it with the use of LSD and ketamine to explore the depths of consciousness. Floating thrived for years until the HIV/AIDS crisis took hold, causing panic among those who still didn’t know how the disease spread and were skeptical of the tanks for sanitary reasons. 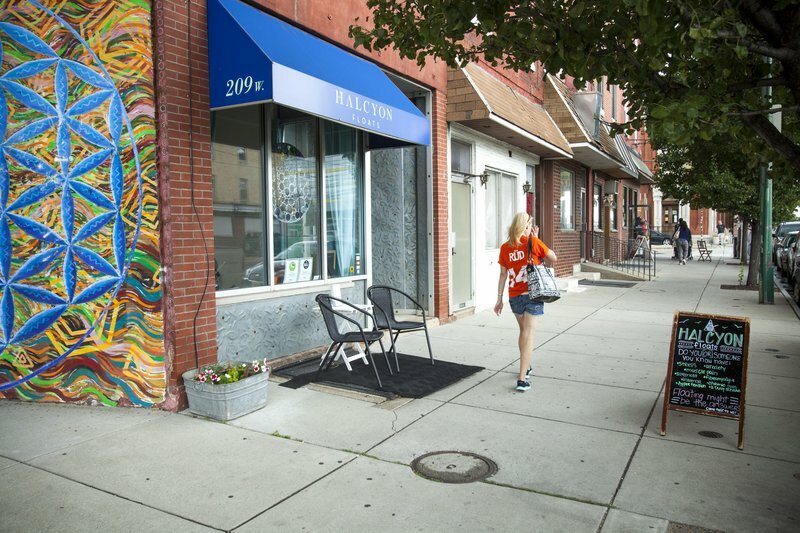 Floating floated right out of public consciousness until shops like Fishtown’s Halcyon Floats recently surfaced to reinvent the experience as less hippy-dippy and more the component of a holistic health plan. But the challenge for float proponents everywhere, Halcyon Floats owner Keri Rackickas told PhillyVoice, is explaining the concept to generations who’ve missed out. “Talking about it personally, people would look at me like I had three heads,” she said. Rackickas is surprised how strong the demand has been in the region: Since opening in March 2014, she’s served about 3,000 people and paved the way for competitors. 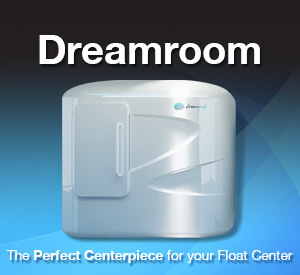 Additional float centers include Flotation Philly, also on Girard Avenue; FLOAT, in Marlton, N.J.; and East Coast Float Spa in West Chester, Chester County. They have all sprouted up this past year. The high demand, Rackickas added, has prompted her to open a second location of Halcyon Floats, coming in October at 6068 Ridge Ave. in Roxborough. 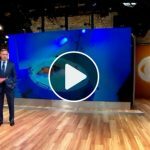 But popularity doesn’t negate the obvious, lingering question: Can floating really surface as a means of healing, or is it just another form of smoke-blowing alternative medicine? Through my own experience in the flotation tank, I hoped to find out. I’m now minutes into my float and, frankly, bored. Restless and completely aware of myself (not at all the goal), I start to wonder whether I’ve done something wrong: Per the instructions I was provided, I’d showered beforehand, didn’t shave that morning, relieved myself before fumbling into the tank, covered my open wounds with petroleum jelly and avoided caffeine. Floating awkwardly with my stiff neck angled slightly above water, my boredom turns to isolation-induced panic at the rate of a switch-flip; I have about 10 minutes clocked in, I realize, and another 80 minutes to go. But just as quickly, the switch flips again. My body lets go. In the next 10 minutes I’m practically comatose — head leaned all the way back into the water and my entire body resting as comfortably as a model in a Serta commercial. My mind dips in and out of a state of what can only be described as the kind of quiet clarity you achieve while drifting off into an anxiety-free slumber. 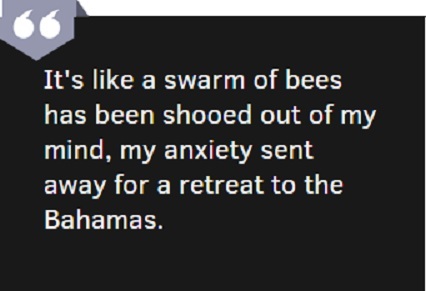 It’s like a swarm of bees has been shooed out of my mind, my anxiety sent away for a retreat to the Bahamas. In my more conscious moments, my spatial perception feels off. While aware that I’m confined in a tank and floating atop what’s certainly more of a puddle than a pool, I feel as though I can reach down at any moment and discover my tank is bottomless. Throughout the experience, I feel my body rotate and move to opposite ends of the tank, only to assess my surroundings and notice I’m perfectly still and centered in the tank. I drift as if I’m an astronaut in outer space, only deprived of the stars’ guiding light. 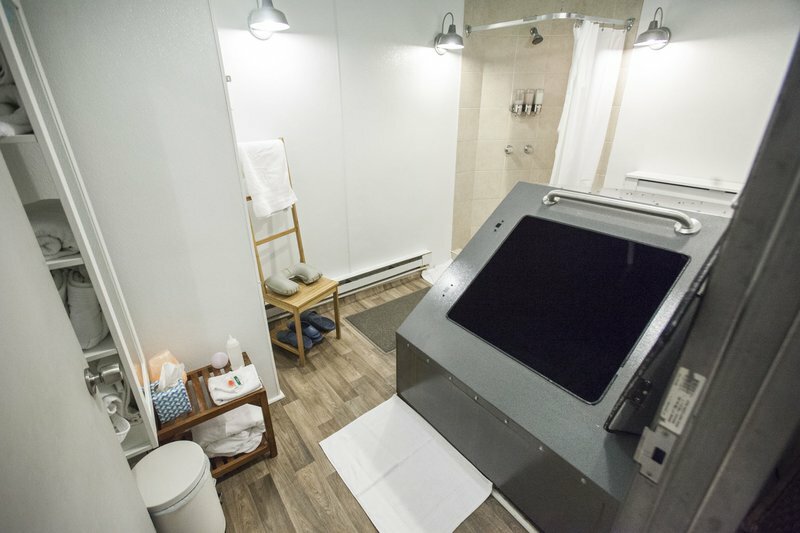 The home stretch of my experience, meanwhile, is admittedly tedious, perhaps because Halcyon’s allotment of 90 minutes is actually longer than many float centers’ 60-minute standard. Or perhaps I feel anxiety over when (or if) the music will start to play, alerting me my session is over. If I’d been allowed a waterproof watch in my last half hour, I’d have checked it by the second. At last, electronic music emanates from speakers inside the tank and I emerge from the chamber like a zombie out of a grave, weak-kneed from the stillness. For the next hour, I embrace a sort of post-float after-glow: I’m light on my feet and serene. 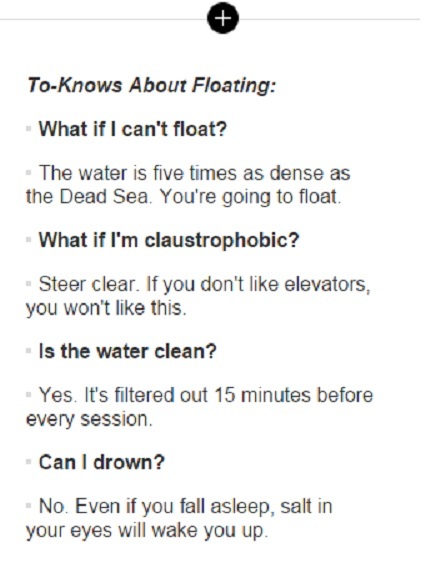 If that’s what it means to float, I’m on board. Mind you, I don’t emerge as “healed” or transformed by life-altering hallucinations. But, curiously, I do find illumination in the darkness, the same kind of reality check and optimism (dare I say, hope) you feel after an extended vacation, only a lot less expensive. Look, despite the warm-and-fuzzy feeling, floating’s not for everyone. Nor is the science behind it definitive. Studies are inspiring but limited. One suggests the floating experience does fast-track the mind to a meditative state, in addition to lowering blood pressure and levels of cortisol — aka, the “stress hormone.” Another supports the notion that it could be a boon to sports performance, so much so that the Philadelphia Eagles at one time had their own flotation tank, according to The New York Times. 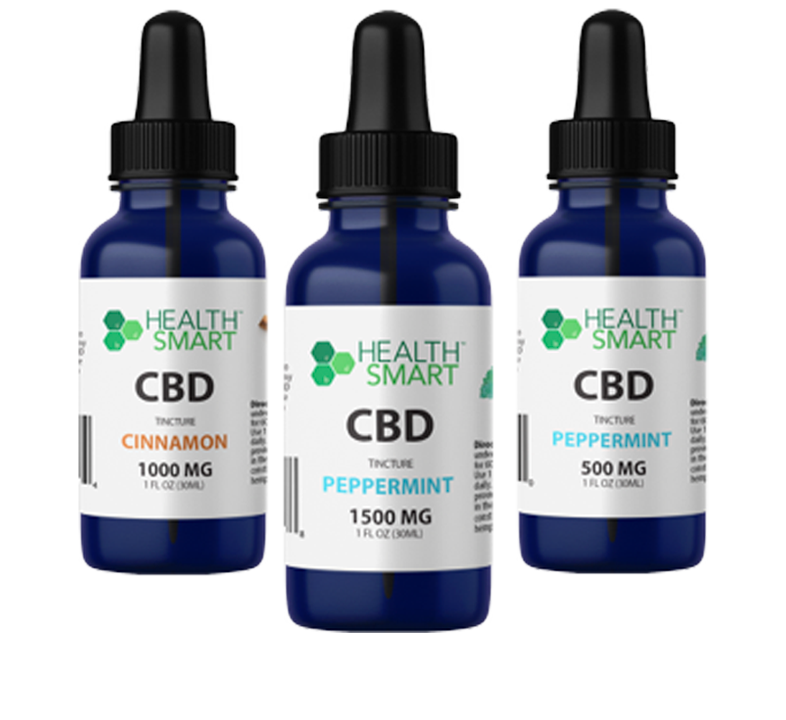 Fibromyalgia patients, meanwhile, are testing it as we speak as a way of managing pain. But these studies are all preliminary and are to be taken with a grain of salt, for now. Michael Baime, who heads the Penn Program for Mindfulness, told PhillyVoice floating should not be considered medical treatment. But, he added, sensory deprivation does boast fairly self-evident effects and may be worth exploring, if only for quality of life. “The truth is that very few of us spend the time we should taking care of ourselves. And for some people, this could be an important way of offering some time and space that would help them undo some of the chronic tension, stress and busyness that makes us unhappy and unproductive. And for those people, this would be a really good thing to do.